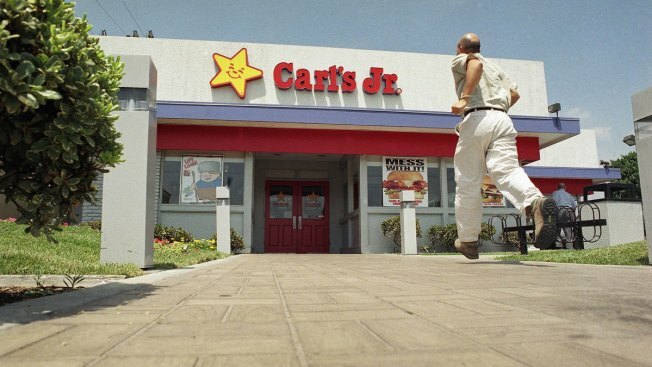 File - In this April 28, 1997 file photo, an eager customer makes his way toward a Carl's Jr. in Los Angeles, Calif., April 28, 1997. Carl's Jr. and Hardee's announced that the chains are ditching the bikini-clad advertisements they're famous for. Carl's Jr. and Hardee's are ditching the bikinis and getting back to the burgers. The chains are famous for advertisements featuring models and celebrities like Paris Hilton, Kate Upton and Emily Ratajkowski munching on burgers while scantily clad. A new commercial for the chains shows the imagined Carl Hardee Sr. taking back control of the operation from immature son Carl Hardee Jr. Carl Sr. rips down photos of swimsuit models and puts up framed pictures of hamburgers. The chains are now calling themselves "pioneers of the great American burger." The company's racy advertising campaign had a defender in Andrew Puzder, who is stepping down as CEO of the chains' parent company, Carpinteria, California-based CKE Restaurant Holdings. Puzder withdrew as President Donald Trump's nominee for Labor Department secretary last month.